It doesn't take an expensive wedding to produce a successful marriage. Glimmerglass Opera's new production of Mozart's The Marriage of Figaro, while perhaps not entirely faithful to the composer's and librettist's original vows, injects something new and exciting into a Marriage whose looks over the years has grown somewhat predictable. It may not have been made in heaven, but Leon Major's budget-minded production appears to join together good singing and staging in holy matrimony. 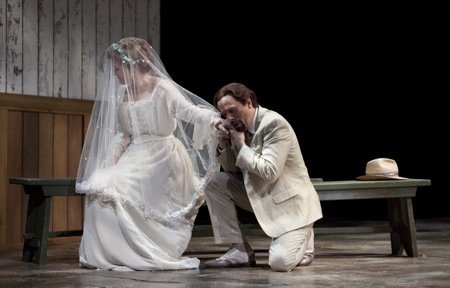 Like all Glimmerglass productions this season, Donald Eastman's sets are culled from the company's 2005 production of Britten's Death in Venice. And while some listeners may feel an understandable sense of déjà vu when they return this season to the Alice Busch Theater, the familiar slanted tripartite walls from past productions look entirely simpatico with Major's tidy staging of the new Figaro. One of the challenges in directing opera buffa is managing the placement of the characters during the fast-paced action endemic to comic opera, particularly during the busy ensemble numbers (duos, trios, quartets, etc.). Major's staging was visually appealing and sensibly choreographed to avoid overpowering the dramatic situations as they unfolded onstage. While I was initially taken aback by the director's early 20th-century venue for the Enlightenment-era setting envisioned by the French playwright, Beaumarchais, I soon found myself buying into the premise: a timeless application of the universal themes of temptation, betrayal and forgiveness. Mark Schnaible's Count Almaviva proved the singular most impressive effort of the performance. Even in his Gatsby-style attire, Schnaible projects the noble demeanor of a timeless aristocrat whose authority is made all the more convincing through the deep pedal tones of his commanding bass-baritone. For the Count's role to succeed, the actor must gain the audience's confidence as a dignified figure while at the same time allowing them to be amused at his less-than-dignified intentions towards Susanna. Schnaible seemed to have found the right balance: His plays his Count not as a well-to-do buffoon, like Dr. Bartolo in The Barber of Seville, but as a frustrated autocrat accustomed to having things his own way, yet clearly unable to, well, close the deal. Schnaible was strong in voice during his lengthy aria of rage during the mighty third-act aria, Vedrò mentr'io sospiro — sung after he realizes he's been duped by Figaro and Susanna. It was Schnaible's ensemble numbers however that impressed me the most, such as in his charming duet with Susanna (Crudel! Perchè finora), where he believes she will at last succumb to his advances, and during the attractive second-act trios with the Countess and Susanna. When in the end Schnaible turns to the Countess and begs her forgiveness, it's not empty words we hear but a sincere expression of a man who is truly remorseful. Soprano Lyubov Petrova crafted a visually appealing Susanna and sang well throughout the afternoon, culminating in a tender and delicate Deh vieni, non tardar — her signature fourth-act aria that proved one of the highlights of the production. Still, the dark and thickly textured timbre of Petrova's voice tended to obscure her vowels, making diction unintelligible at times and muddying the balance of voices during ensemble numbers, such as in the sharp-tongued first-act duet with Marcellina (Via resti servita). I would love to hear Petrova sing Venite, inginocchiatevi one more time — only without being rushed by conductor David Angus, who appeared to be in a hurry throughout the performance. 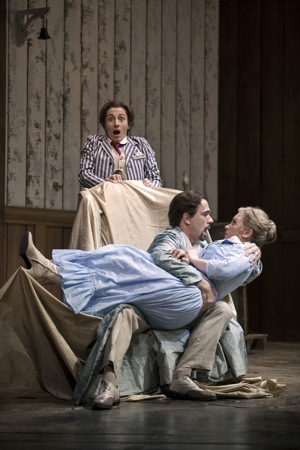 This delightful aria, in which Susanna playfully dresses the page Cherubino in women's clothes while coaching him on girlish mannerisms, deserved a better fate. As the Countess Almaviva, Caitlyn Lynch sang in an exquisite, dignified soprano that underscored not only her elevated station in life as the Count's wife, but also her character's virtue and integrity. As an actress, Lynch played her part to perfection — forging a sympathetic character who remained steadfast and loyal to her husband though all the lies and deception, and ultimately choosing to pardon him in the end after he begs her forgiveness. Although Lynch's phrases were obscured by too fast a tempo in her second-act Porgi, amor, her vocal talents shined forth during her signature third-act Dove sono, which was gently delivered with great nuance of phrasing — particularly at the recapitulation, where Lynch repeated the main theme in a soft, sweet whisper. Aurhelia Varak cuts a cute and loveable character in the pants-role part of the confused teenage page, Cherubino. She does however limit her role to that of a one-dimensional shirt-chaser — enough to get the laughs, certainly, but falling far short of the librettist's design of a confused, angst-ridden boy unable to comprehend the hormonal changes that seems to have hijacked his body. Yet in spite of the dramatic shortcomings Varak crafted a sympathetic figure compelling enough to earn the listener's compassion, and her comedic visual antics onstage (transversing a variety of disguises and hiding places) were invariably amusing. Varak's handsome mezzo-soprano is well-suited to invoke the image of the troubled teen. While I wished that there had been more hint of angst in Non so più cosa son — the aria in which Cherubino explains how women make him dizzy (Mozart intentionally writes in short hyper-ventilating phrases here, as if to capture the youth's throbbing pangs of anxiety) — Varak gave a credible performance in her two signature arias, and her pitch throughout the afternoon was rock-solid. Patrick Carfizzi did not have an especially good afternoon as the wily Figaro, unable to muster anything more than an uneven vocal delivery. Carfizzi's voice seemed tired almost from the start, and he had problems keeping in-pitch during even the most straightforward melodic figures of the slowly paced triadic arpeggiations of the first act Se vuol ballare, and again in the brief reprise of this aria in the second act. Carfizzi fared much better in the soldierly Non più andrai, his best effort of the afternoon which he delivered in convincingly fashion and in good voice. Still, the baritone fizzled out during his character's rant against womankind in the fourth act Aprite un po' quegl' occhi, which was, like his acting throughout much of the performance, ineffective. Carfizzi was most successful when singing with others during the many ensemble numbers in this work. The production's smaller roles, assigned to members of Glimmerglass's Young American Artists Program, were especially noteworthy and deserving of recognition. Haeran Hong was delightful as the gardener's simple-minded daughter, Barbarina, commanding an immediate stage presence even during the recitatives. Hong's fourth-act cavatina (L'ho perduta), where she searches in vane for the lost pin, was sung with a gorgeous vocal delivery and just the right touch of maudlin to capture her childlike image. 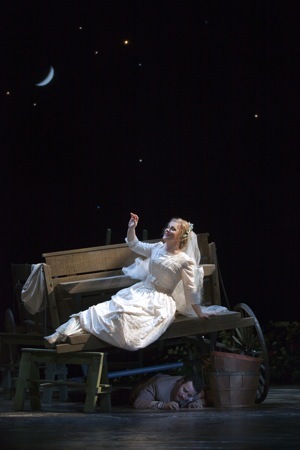 Courtney McKeown was a formidable Marcellina, the would-be spoiler to Susanna and Figaro's nuptuals. McKeown's attractive soprano projects well and she played her part with a perfect mix of humor and absurdity, such as in the charming first act duet with Petrova (Via resti servita). As the imbibing gardener, Antonio, Robert Kerr molded an uproarious figure whose slovenly manner of dress reminded me of Danny Kaye's alter ego, Clem Kadiddlehopper. Kerr, who some may recognizer as the Sacristan in the current Glimmerglass production of Tosca, sang with a splendid baritone that I hope to hear again in upcoming seasons. In a similar vein, Alex Mansoori as the music teacher who, like the Count, has an eye for Susanna, forged an engaging and suitably comical Don Basilio and sang with an agreeable tenor that suited his character. Adam Fry, as a much-too-young looking Dr. Bartolo, appeared miscast in this role — having none of the looks and mannerisms associated with his stock commedia dell'arte character, and lacking the bass-baritone timbral quality necessary to put the "vendetta" in La vendetta! Directors as a rule love to place old wine in new bottles, and with an opera produced as often as Figaro, it's rather expected of them as well. Thankfully, Major's innovations added a dimension of freshness and not just novelty. Perhaps the most unusual departure takes place during the fêted military parody of Figaro's Non più andrai, after the Count — having exceeded the limits of his patience with the love-struck Cherubino — commissions the boy to join the army. Instead of giving the young man a rifle, Figaro gives him a shave (the director's nod, perhaps, to the comic scene between Figaro and Bartolo in The Barber of Seville). Eastman's broken-down barnyard wagon that serves as a hiding place during the fourth act was simple yet effective in presenting the peek-a-boo antics of the characters as they spy on one-another. The moonlit, starry-skied backdrop to the wagon — with its projection of stars in various sizes and levels of brightness — was also a nice touch. Matthew Pachtman's light-colored and pin-striped costumes suggest Europe during the first decade or so of the 20-century. As mentioned earlier, David Angus' tempos throughout much of the performance were generally rushed, which is a shame: Mozart's enchanting melodies fare much better when savored, not swallowed whole. The conductor's preference for brisk tempos extended to several arias and cavatinas that demand listener attention, such as the poignant Porgi, amor, where the Countess laments the waning of her husband's affections. To her credit, Lynch tried to relax the tempo during the aria's recapitulation, although by that time the mood had been lost. The Glimmerglass Orchestra played quite well, including some impressive obbligato wind parts in the concertante-style accompaniment to Susanna's Deh vieni, non tardar. I was not impressed with the sound of the amplified fortepiano that accompanied the recitatives, which I thought would have been better served by an acoustic harpsichord. Photo credits: Karli Cadel/Glimmerglass Opera.